After my long road test of last Tuesday, I was itchin’ the hit some singletrack. I talked to my friend and co-worker Justin, and he had never been to the mountain bike trail at the Cleveland Metroparks‘ Ohio & Erie Canal Reservation. I had been there twice before, but it’s been almost two years, so even though it’s a pretty short 2.5-mile loop, it’s not a long drive away, so I figured it was worth the trip. We headed up there last Thursday morning. I arrived a little earlier than planned, so I did the 1/2-mile beginner loop on my own a couple of times to warm up until Justin arrived. The two of us hit the beginner loop, then moved on to the intermediate loop. We weren’t disappointed. The trail was in fantastic shape–smooth and dry; not a single patch of mud. The folks from the Metroparks and the Cleveland Area Mountain Bike Association are doing a great job of maintaining this trail. Near the beginning of the intermediate loop is a climb that’s a bit more of a kicker than I remembered. The rest of the trail has a series of short, undulating ups and downs, a few hairpin turns, and a couple of rough rock and root gardens. What this course lacks in size it makes up for with challenges good enough for any local off-road riders to get their singletrack fix without having to head too far out of the city. After a second lap on the intermediate loop, Justin suggested we head down to his home turf, to the mountain bike trails at Reagan Park in Medina. Although it felt against my “car less” sensibilities to do even more driving in order to do more pedaling, I had the whole day with no other obligations to worry about, so I figured what the heck, variety is the spice of life. We hit a few brief rain showers during the drive down to Medina, but the sun was back out by the time we reached the parking area at the Huffman Park soccer fields. The trail was none the worse for wear; smooth and dry. There were a couple of very isolated mud patches, but nothing to worry about. The Reagan Park trail system is made up of four major sections, with a couple of connector trails. For some reason, I always get confused trying to follow the suggested route to connect all of the trails. I finally realized this time around that the key is, “Don’t over-think it.” Just follow the signs, and trust that they’ll lead you the right way to hit all the trails. You’ll double-back a couple of times on trail that you’ve already hit, but it’s only for brief periods to get to the next section. My Mongoose Teocali Super mountain bike came with Kenda ExCavator 26×2.1 tires. Some of my riding buddies have suggested that these tires have too aggressive of a tread for my needs, and I could use something lighter. At 640 grams each, they’re no pigs, and I’ve found that they performed adequately for me. However, before riding the bike for the first time this season, I decided to try some different tires, just for the sake of trying something different. 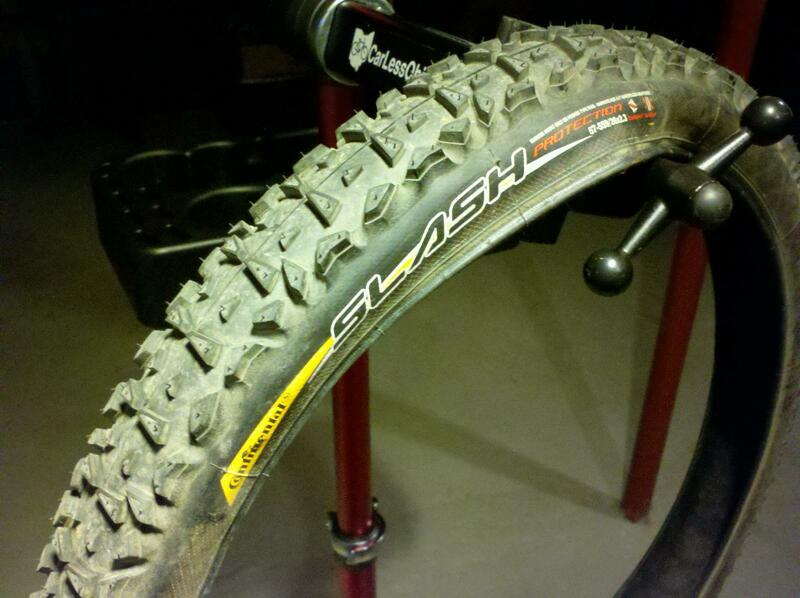 I’ve had a pair of Continental Slash ProTection 26×2.3 tires around for the past couple of years. It’s a discontinued model, so when they started being offered at blowout prices, I decided to pick up a pair just to have as a backup set if needed. Now seemed like a good excuse to give them a try. They’re pretty comparable to the Kendas at 660 grams each, but with an even more aggressive tread–a fairly square profile with tall side knobs. Continental tires tend to run a bit narrower than labeled, so to the naked eye they appeared about the same width as the Kenda ExCavators when mounted on my wheels. I’ve never been really picky about tires. I recall reading tire reviews in the past, and often the authors complain that when tires have tall knobs, they can feel the tire squirming too much underneath them. I always read that with a bit of skepticism, thinking, “They can’t possibly really feel that.” But, as it turns out, I could. The steering of the bike felt kinda squirrely, and I felt like I was about to wash out in sharp curves more often than usual. To be fair, this tire is billed as a rough and wet conditions tire, and I’m sure it would perform great in those conditions. I’ll put them away until I head to Pennsylvania or West Virginia, but for typical Ohio trails (when they’re in permissible-to-ride condition), they are, indeed, TOO aggressive. Having another free day yesteday, with a good weather forecast, it was the perfect chance to head down to my favorite trail, the mountain bike loop at Mohican State Park. The night before, I pulled another spare set of tires out of the archives. The trail, as usual, was in excellent shape. 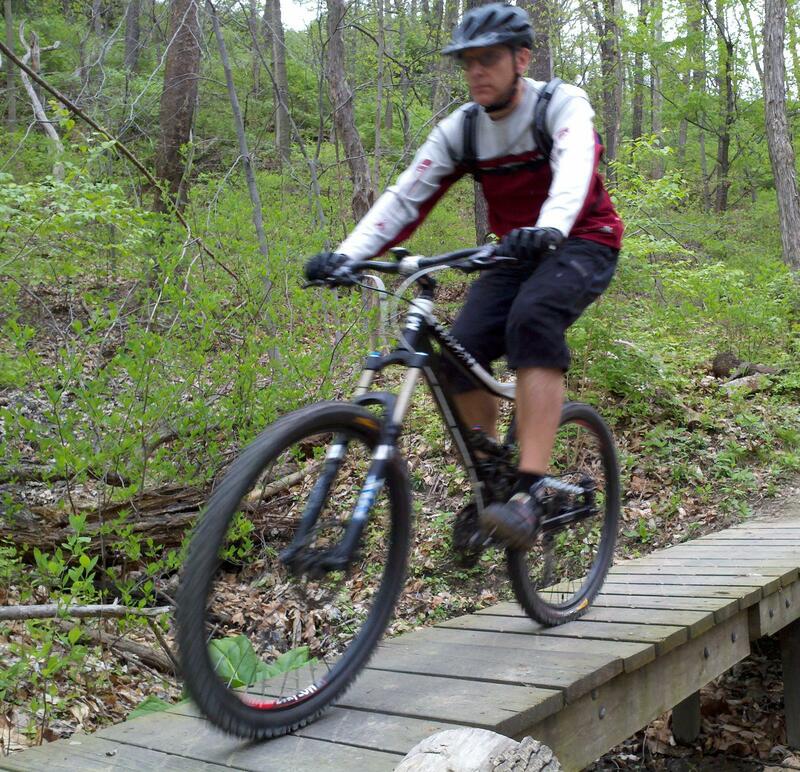 Huge thanks, as always, go out to the Mohican/Malabar Bike Club for creating and maintaining such a fantastic trail. I finished the 25-mile loop in what I believe is a personal best time–2 hours and 38 minutes, which does not include a very brief stop at the 15-mile rest area to down a pack of Gu. Part of the credit for the good ride goes to those other new tires I mentioned. The tires are Slime SRT XC 26×2.00. I picked these tires up a few years ago when one local branch of a national big-box sporting goods chain was having a store closing clearance sale. At $5 each, it was a deal I couldn’t pass up. The SRT stands for Standard Rim Tubeless. The tire is like a tubular tire, but with a bead that works on any standard hooked rim. Of course, it’s also pre-filled with Slime’s neon green sealant. The idea was that you could get the benefits of tubeless tire technology, without the hassles of needing tubeless-compatible rims, special rim strips and valves, bead seating problems, etc. This XC version of the tire has a semi-aggressive tread that hits the sweet spot between too smooth and too knobby–perfect for dry, fast trail conditions. It’s a similar tread to something like the Geax Saguaro or WTB ExiWolf. I think they also made a version with a more aggressive freeride/downhill tread, and maybe a slick version, too. I had these tires on an older mountain bike that I used for just kicking around the neighborhood a couple years back, but this was my first real ride using them on singletrack. That “just right” tread performed perfectly on the buff singletrack of Mohican. It didn’t hold me back on the smooth stuff, and had enough grip to hold the line on curves and whenever the trail turned a little rough or uphill. I ran them at 35psi. By the end of the ride, I thought maybe I could drop them by 2-3psi; not for lack of traction, but just to soften the ride up a tad. The tires weigh 860 grams each. Compared to the Kenda ExCavators and Conti Slashes, there’s a pretty much negligible weight difference (20-40 grams) if you add in the 180-gram weight of a typical 26-inch presta valve tube. Unfortunately, these tires are one of the best products that you can’t buy, unless you can find a shop or online dealer that has some way old stock still sitting around. I talked to the folks from Slime a few years ago at one of the bike trade shows. They said that they didn’t give up on the idea because it didn’t work well; the feedback they got from other users was as good as what I experienced yesterday. The problem is that many mountain bikers are very particular about their tires. With the dozens of tire manufacturers providing literally hundreds of choices of sizes and tread patterns, there is plenty of supply out there to satisfied the varied tastes of all of those riders. Slime felt it would be impossible for them to come up with enough different variations of their tires to meet that demand. I’m lucky and glad that I grabbed these tires when I had the chance. 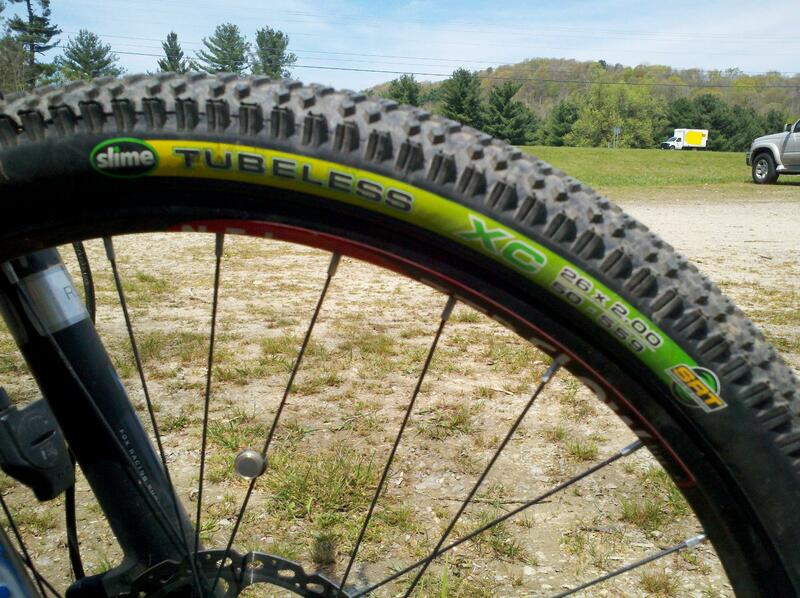 During whatever (hopefully long) life that I get out of them, they’ll be my go-to tires for riding my go-to trails.